Skinner Releasing Technique (SRT) is an innovative approach to dance training developed by Joan Skinner in the early 1960s. SRT utilizes image guided floor work to ease tension and promote an effortless kind of moving, integrated with alignment of the whole self. Tactile exercises are used to give the imagery immediate kinesthetic effect; spontaneous movement is frequently evoked by imagery and movement studies. The images are metaphors for movement principles within the natural laws of relativity. The guided poetic imagery triggers spontaneous improvised movement. SRT smoothly integrates technical growth with creative process. The workshop will offer studying the stillness (listening and giving in to gravity) and observing the reflexes at work by following the natural laws of movements. We are going to develop skills by gathering information with the senses and practicing simple moves that support safety and trust when taking physical risks. The aim is to have a deeper understanding of the principles of CI and by practicing the dance we will learn about composing with a sense of knowing. Eszter Gбl is a dancer, teacher and choreographer, currently living in Budapest and a member of L1 Independent Dancers Partnership. She studied physical education and physiotherapy in Budapest, and dance in Arnhem, The Netherlands. Since 1993 she has been creating her choreographed and improvised works and she regularly teaches, leads and participates in international performance projects and festivals in Europe, Russia and in the US. She is a certified Skinner Releasing Technique Teacher and taught SRT in Hungary, Slovakia, Holland, France and Seattle (USA). She was the chief organizer of the 15th ECITE (European Contact Improvisation Teacher's Exchange) in 2000 July in Budapest and she has been the artistic director of Kontakt Budapest International Improvisation Festival since 2002. Jeremy Nelson trained at The London School of Contemporary Dance and went on to dance for The Siobhan Davies and Second Stride Dance companies in London before coming to New York in 1984. He was a dancer with The Stephen Petronio Dance Company in New York from 1984-1992, returning as guest soloist in 1995. In 1991, he won a New York Dance and Performance ("Bessie") Award for outstanding performance with that company and in 2004 was a recipient of a John Simon Guggenheim Memorial Fellowship for choreography. He was an artist-in-residence at Movement Research in 1994/1995 at Dance Space Center in 2003/2004. He now works as an independent choreographer, teacher and dancer. He has performed in the work of David Zambrano, Mia Lawrence, Luis Lara Malvacнas and Susan Rethorst as well as in his own work. He has also worked with contact improviser, Kirstie Simson in an improvisational group and performed in installation-improvisations organized by Luis Lara Malvacнas. He has been presenting and performing his choreography in New York since 1994, and has shown his work several times at Movement Research at Judson Church and in the Lincoln Center Out-of-Doors series. He has been produced on five occasions to create work in shared programs for various New York venues including Danspace Project at St Mark's Church in 1995, 1996 and 2000, and PS 122, in 1998. 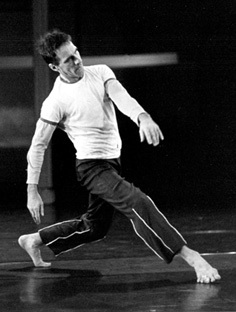 In 1999 he presented Morphylactic, a collaborative choreography with Luis Lara at Dance Theater Workshop. He has shown a full evening of his own work at Danspace Project at St. Mark's Church in 2002 and again in November 2004. He has also performed his work in various countries, including Canada, Chile, England, Germany, Japan, New Zealand, Spain and Venezuela. Performances in 2005 included The Full Moon Festival in Oulo, Finland; The Riley Theatre in Leeds, England; Pomona College in California; Montevideo Sitiada Festival in Uruguay; Rafaela and Buenos Aires, Argentina; and Danzalborde Festival in Valparaiso, Chile. 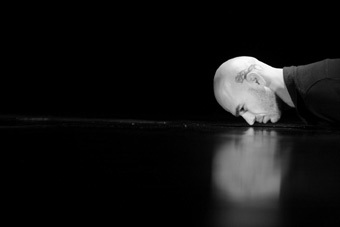 He has been commissioned to create works on companies such as Espacio Alterno in Caracas, Venezuela, Xoroftes in Athens, Greece, Ricochet Dance Company in London, England and Footnote Dance Company in New Zealand and in 2003 created "The Fact that it goes Up" for Phoenix Dance Company in Leeds, England. It was performed as part of a national tour in 2003 that included venues such as Sadler's Wells Theatre in London. He has studied Klein TechniqueT with Barbara Mahler and Susan Klein for the past 20 years, and is certified to use their technique as a theoretical basis for his contemporary technique classes. Other studies over the past several years thqat influence his teaching include Alexander TechniqueR with June Ekman, Bodymind CenteringR with RoseAnne Spradlin and ongoing studies in Contact Improvisation, including with Kirstie Simson and K.J. Holmes. The classes are influenced by Nelson's 18 years of continuing study of in the alignment work of Barbara Mahler and Susan Klein, and by more recent studies in Alexander TechniqueR, Contact Improvisation and Bodymind CenteringR. The warm-up focuses on our skeletal structure to access the deep supporting muscles of the body, allowing mobility and suppleness in the superficial muscles. The class emphasizes the connection to and use of the floor, and encourages a deepening awareness of the whole body as a way to learn and to develop dynamic, articulate and expressive dancing. The class builds from simple exercises to phrases of movement that involve moving boldly, covering lots of space, taking chances off balance and finding a strength, specificity and ease in our dancing. In this composition class, dancers receive a basic introduction into the movement system of Rudolf Laban. Unlike most Modern Dance techniques, Laban is a way to organize space by moving in a highly individual way. The class will present different models of the dancer's space (,Choreutik') and show the possibilities of developping choreographic tools out of this model. For intermediate dancers of all styles. Jochen Roller, born 1971 in Berlin, studied classical ballet at the Berlin Opera and choreography at the Laban Centre in London. He has been working with many different choreographers as well as creating his own pieces. Last works include the solo-triology ,perform performing' (2002, 2003 and 2004) and ,mnemonic nonstop', a duet with Martin Nachbar. The course will gives the students a variety of tools for starting step by step understanding how to create composition in real time, how to develop their own language and how to communicate the dance out side to their partner and to the audience. These tools can be used for creating solo, duets and group improvisation. Through working with sensations, with different skills of the body and connecting all that we do through the awareness of the mind. We will work in simple structures and inside of them we will learn more about the process of making a decision in every minute. In every class we will research different team that will open new doors to our dance. Using games and playfulness to find our enjoyment in our dance. An independent creative artist since 1996. Graduate of the Jerusalem Rubin Academy of music and dance and also of the Hebrew University, Jerusalem where she studied theatre and musicology. She is the Winner of the 'excellence in performance' prize in the Gvanim b'mahol (Shades in Dance) festival in 2000. House Artist of the "ZIRAH" theater in Jerusalem 1998-1999. She is continuously is invited to teach and perform in Europe (Switzerland Spain, Ireland, Germany, Austria, and Russia) and Far East, creating improvisation and dance- performances. In the last summer she was invited to create a dance for "Echo-Echo" Dance Theater Company in Ireland called "Resonance" that preformed in different places in Europe. Her last dance peace called "PLAYSTATION" is preformed in Israel these days. Today she lives in Tel Aviv, and in her school (Play) there are more than 70 students, learning in different programs. The class goe's out of the classic techniqe and uses it for the terminology and methodology, we will use impro techniqes, yoga, feldenkrise, Gaga naharin and some new principles I use myself in my work. The class is only for traind dancers who are willing to explore and take the time for listning for their body. The class will be a condenced lab for a solo work. Every meeting is for two hours. In every meeting we will work on one of the following: Creative writing, music, space, momement choices, theatrical aspects and cet. The participents must be trained dancers who wants to explore different ways of search and composition . Sahar Azimi was born in August 1974 in Hadera That Lies IN the Center of Israel. 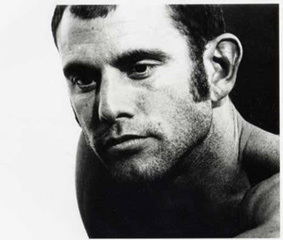 After his military service in 1994 he joined Inbal Dance Theater and worked with Margalit Oved Marshall, later this year he danced in Koldemama Dance Company with Moshe Efraty as the artistic director and worked also with Anat Daniely, Daniela Michaeli and more. In 1995 Sahar joined the Bat Sheva Ensamble with Ohad Naharin and Noeni Perlov as the artistic directors and danced the pieces of Jiri Kilian, Angelan Perljocaj, Linda Gudro, Lara Barsaqe as well as Ohad naharin's. in 1998 sahar left the Bat Sheva Ensamble and started his way as an independent dancer. He danced with many choreographers since then until now days , Barak Marshall, Noa Dar, Emanuel Gat, Ronit Ziv, Dededance company, Vertigo Dance Company and Javier De Frutos.In 1998 sahar won the America Israel foundation scholarship for dancers.In 1999-2000 sahar worked as a therapist with autistic people in a village for life in Israel, there he met Itzik Vingerten and was invited to join the cast of "then we hugged" that later won the prize for the best play in Aco festival for different theater. During the years 2000 - 2001 sahar worked with "Clipa" theater with the artistic directors Idit Herman and Dimitry Tulpanov. In the 2000 sahar created his first solo "Hasufit" to the 'Intimadence' festival in Tmuna theater In tel aviv, in 2001 sahar created a quartet for 3 dancers and an opera singer " Mara" in the Du Oman festival in Habima - the national theater of Israel.In November 2002 sahar premiered "itisasitis" , a duet with an actress in the Curtein UP festival in Suzan Dellal Center that was also invited to perform in Sau Paulo for the SESC dance festival/ Fabrica Europe festival and in Croatia. In November 2003 Sahar premiered " So said Herzel" in Curtain Up Festival and performed with this piece in Beograd, Budapest, uzes (france),Lossane,Croatia and Germany . In October 2004 sahar Joined Svetlana Livshits and together they created " White Dance " - a piece presented in the sea and on the beach and put together dance, visual arts, music and text, white dance participate the contest in Aco festival for different theater. In November 2004 sahar premiered " Now I want to forget" in Curtein Up festival And recived good revies and success. In February 2005 Sahar premiered the solo "interpretation" in the ADC in Kyoto and the session house in tokyo, his last piece " living room in six parts" took part in "x-po" in the 'Lab' in Jerusalem and " Curtain up 2005" Sahar also teach in Israel and around the world. Sahar won the prize for young choreographers from the minister of culture and the department of dance for 2005. sahar also won the support of Teva industries for 2005. I consider choreography as a whole, from the moment I start thinking about it, writing down those thoughts, to its materialization and physicality, rewriting those thoughts down, procedural trash, that banana I eat while deciding what ideas I should abandon, up to the materialization of the whole choreographic process. I am especially interested in the codification of the choreographic process as an end in itself. I basically work with the concepts of time, process and writing. Time at different levels: the language level, time referred to the action as it is happening, time in the writing process and cinematographic and photographic time. Regarding process, I try to get the audience involved in the continuous flow of the creative process. Regarding writing, I am interested in the piece of writing transformed into an image, and the relationship between this piece and the action. I am interested in presenting a constant multidisciplinary transition between codes of literature, video and dance. (drama) I want the audience to perform a double reading. On the one hand I want the audience to read the work in progress. On the other hand I would like my audience to interpret the actual code, drawing bridges and using other codes. I am interested in alternating elements from everyday life, biography and fiction biography, switching from dreams to reality and to meta-linguistics in a constant relation to the building process and the transformation on stage. I try to give every fantasy an actual chance on stage. I am interested in de-contextualizing part of the reality, trying to find the fragility this fact produces. I give equal value to success and failure. I need to manipulate what is real and concrete. I look for a transformation of reality that allows a new reality, close and concrete, far away from the abstract. So the idea is to make the participants enter in all this concepts through practical exercises from the first day and build different situations that they will formulate with the rules I will propose to them. From the very first day we will build simple actions that will conclude in a more complex choreography organisation. The idea is to share responsibilities in an open process of who to generate choreography in different ways. Juan is performer and choreographer and studied ballet, contemporary dance and video in Spain and USA. He received several grants to study at Movement Research in New York, city where he also studies different techniques and yoga. Since 1987 he works as a performer with the choreographers: Blanca Calvo, Carmen Cortйs, Olga Mesa, Inaki Azpillaga, Cesc Gelabert, Ana Buitrago, La Ribot, Cuqui Jerez, Gilles Jobin, Jйrфme Bel, Xavier Leroy and Tino Shegal. He works as artistic assistant with: La Ribot, Gilles Jobin, Carmen Cortйs, Olga Mesa and Cuqui Jerez. Since 1993 he teaches classes and workshops and since 1992 he develops his own work collaborating with: Blanca Calvo: Los Juan caballos1992, Inaki Azpillaga: 7 montanas y 7 rнos video directed by Utray and Lamadrid 1993, Ana Buitrago: Retazos 1996, Susana Casenave: Peces 1996, and Carmen Cortйs: Asн que pasen 100 Anos 1998. Individually he creates the videos: UN JARRO DE AGUA FRНA 1993, BRADOU 1994, JARABE TAPATIO 1995. The pieces: POLLO DIRECTAMENTE 1995, EL PELIRROJO 1997, THE TASTE IS MINE 1999, ALL GOOD SPIES ARE MY AGE 2002 AND THE APPLICATION 2005, SEVEN ATTEMPTED ESCAPES FROM SILENCE 2005. He is artist in residence in Podewil (Berlin) 2004 and 2005. Since 2003 he is Director and Curator of the season In-Presentable at La Casa Encendida, Madrid. Somatic Movement Coaching Support yourself! This class teaches a somatic approach to dance technique. It is appropriate for dancers at all levels who want to increase their movement awareness and focus. The Floor Kata embodies the idea of refinement. The adding of more and more specific Somatic Movement Coaching principles to the movement sequence, cultivates understanding of dance technique and discipline. It teaches us how we organise our selves in space and time. The sessions will start with a general warm-up, enlivening mind and body and will then move into the teaching of the actual 'Kata', a very specific movement sequence performed on the floor. Through the performance of the Floor Kata, techniques for flow of movement, balance, coordination, breathing and focus are developed. Done properly, The Floor Kata is an excellent physical as well as mental exercise. Note: The word 'Kata' is derived from the Kanji characters meaning 'shape', 'cut' and 'earth' or 'soil'. A Kata is literally a 'shape which cuts the ground'. The balance between support and expression as well as the direction and flow of movement give the Floor Kata its specific character. Somatic Movement Coaching Express yourself! This improvisational dance class gives you a lot of space for expression. Students will perform structured improvisations and learn how to coach each other using the Soma Mapping method developed for Somatic Movement Coaches. Note: The Soma Map offers an overview of all areas. We will choose the ones that will be of interest to the group of participants. 1. Balancing Externally: the dynamics of movement. Exploring the structural aspects of movement; like the skeleton-muscular and the articular systems. 2. Balancing Internally: the quality of movement. Exploring the functional aspects of movement; like the visceral and cardio-vascular systems. Integration The way we Integrate our movements in time and space gives meaning to our dance. 3. Organising our Movements: the flow of movement. Body, time and space: exploring regions and rhythms, paces and phrases, layers and levels. 4. Principles of Guidance: the focus of movement. Exploring our senses and perceptions, how they guide our actions and help express our intentions. 5. Understanding Development: the unfolding of movement. Exploring developmental patterns, forces and underlying reflexes and responses. Together they expand are possibilities to express our selves in movement. Jacques van Eijden, dancer and pedagogue at heart, has moved through the fields of psychology, movement, the arts, dance, and architecture around the world for more than three decades. His movement training and performance experience in Europe, the USA and Australia with (a.o.) Elaine Summers, Russell Dumas, Marsha Paludan, Pauline de Groot, and especially John Rolland established his affinity with improvisation, creative dance and somatics. Later his interest in health issues in the arts took him even further into this field especially during his collaboration with Bonnie Bainbridge Cohen in running the first Certification Programme of her work in Europe. In his work he has integrated principles of several movement and meditation disciplines. 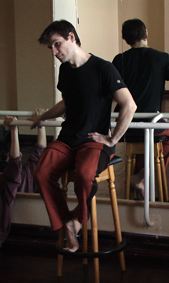 Western disciplines such as Gymnastics, Hawkins based Pauline de Groot technique, Contact Improvisation through his studies with Nancy Stark Smith. Todd Alignment, Release- Technique with Marsha Paladin, Nancy Topf and John Rolland. Eastern disciplines such as Iyengar Yoga, Sitting Practice drawn from the Tibetan and Zen Buddhist traditions, T'ai Chi and Tai Jitsu. He developed somatic approaches to movement and aesthetics of the Amsterdam School of Higher Education in the Arts (AHK), at the School for New Dance Development (SNDD) and the Department of Creative Dance. As one of the teachers of somatics and head of the somatic guidance team at the SNDD for 10 years, Jacques van Eijden brought a somatic view to dancers and dance makers in the field today. He co-founded Stichting Vie Male in 1988, a dance productions foundation based on the role of body intelligence in the creation of dance, that later influenced the formation of the Institute for Somatic Movement Studies in 1999. His work continues to bridge different disciplines, transforming Body Intelligence into art, health, quality of life and effective action. The japanese word ki is a word used for energy: more specifically the living energy that supports all forms of life and is present in the world around us as well as in our bodies and minds. In Aikido, a japanese martial art, four principles of ki - keeping one point, relaxing completely, extending ki and keeping the weight underside - are defined and trained. In dance they are useful tools for dealing with the flows of energy in one's body and in dancing with partners. In this workshop we will practice the energetic principles offered by Aikido and use them in exercises on basic skills such as carrying, falling, lifting and flying, while maintaining physical contact. In improvisation we will transform the exercises into playful encounters. In this workshop we will look at a way of making contact-improvisation performative. We will focus specifically on two elements: multi-tracking and choice-making. Multi-tracking is a term borrowed from music: having more than one track open at the same time. For dance this means being able to focus on more than one element of what is going on at the same time. Choice-making is a rich and sometimes undefined proces. We'll look at the sources of choices: the touch, our culture, memory, theatrical triggers and diverse physical sensations, and at how to integrate these choices in a contactduet. With all these elements - and being in physical contact most of the time - we will improvise, play and watch each other. This workshop is open for people with solid experience in c.i. and an interest in performance. Natanja den Boeft is a freelance dancer/teacher/artist based in Amsterdam. 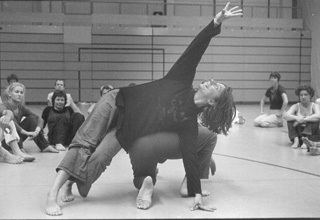 She has been teaching since 1987, in (contact)improvisation, technique, composition and performance skills, to professional dancers and actors, as well as amateurs in a wide range of backgrounds. 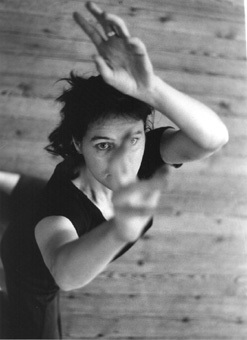 From 1992-1999 she was a staffmember at the Theaterschool Amsterdam, department 'School for New Dance Development', in improvisation and contact-improvisation. She regularly teaches workshops and guest classes at various dance-academies and studios throughout Europe and in Japan. In 1986 she started her ongoing practice in Aikido. She practices and teaches at the Shin Budo Kai dojo in Amsterdam. The practice of Aikido has over the years become an important influence in her dancework, especially in contact-imprvisation, for its use of energy, centered strength, space and direction. Besides teaching she makes films and site-specific performances, she writes and photographs. The classincludes basic elements of body work such as work with floor, weight and release, and simple dance combinations. The class mignt be interesting not only for begginers but for intermediate dancers. The workshop is bazed on two interaction aspects - Space and Time. Lab is going to research formal ways of organizing connections between space and dancers in it. Time is an important instrument for organizing dance structure. It defines how the composition is situated not only in space. The class reflects the experience gained from modern and release based dance intensives and a broad stage practice including work in the Kremlin ballet for 9 years, Sasha Pepelyaev's project for 10 year and 7-year teaching; as well as personal exploration and research. The class challenges the process of crystallising the authentic movement's algorithm by designing the relationships between mind and body and searching for an effective and efficient use of the body potentials. The lesson includes simple exercises which can serve as a platform for practicing any principals of any dance styles. Those will be followed by more complicated dance phrases where such principles as reason and circumstance, fall and balance, travelling in the space, inertia and weight and coordination of jump will be applied." Tatiana Gordeeva started to dance at the age of 6. She graduated from Moscow Ballet Academy in 1990 with the diploma of excellence. She worked for the Kremlin State ballet as a soloist for 9 years. Tatiana finished her ballet dancer's carrier in January 1999. In 1995 Tatiana was invited to joint Sasha Pepelyaev's project "Kinetic" (now Apparatus Theatre Group). Since then, she has taken part in all company's performances. Her solo performance "Ichbinbeidir" was a nominee of the National Theatre Award "Golden Mask" in 2002. Tatiana works as an educational programme manager in Moscow Dance Agency TSEH since 2001. She is taking her attestation for the 1 Kyu grade in Ki Aikido at the end of May, The Ki Federation of Great Britain, Moscow branch, Sensei D.Popolov, 2nd Dan. "This class utilizes my 16 years of study with Susan Klein and Barbara Mahler, emphasizing anatomic realities as a way to connect to one's entire body on a practical level. Using the floor as an ever-present fulcrum from which to move into space is addressed as a reality while also acknowledging its metaphoric connections to how an individual moves through the world. Each participant is given the opportunity to work at their own speed, address personal patterns and begin to know - through body felt experience - where they are at each and every moment. This leads to the potential of moving from an identity underneath "personality". Putting this potential into a creative dance practice takes place in the class called PERFORMANCE. " Performance "I view this class as an experiential lab, a place where the body itself can be utilized as an entry point for the discovery of unexplained phenomena. Each person will practice using their embodied knowledge to perceive, create, and navigate the moment through movement. Dancing will take place as a group as well as individually, with equal emphasis placed on action and observation. To get the most out of this class, enrollment in the TECHNIQUE class is highly recommended." - W.C.
Wally Cardona was raised in California and New Mexico. A competitive gymnast ages 7 through 9 and a clarinetist ages 11 through 15, he began dancing at age 19. In 1986, he moved to New York City to attend The Juilliard School (B.F.A.). The following summer, invited by (and under the tutelage of) Benjamin Harkarvy, Cardona attended the Ballet Project at Jacob's Pillow and there danced in a work by Ralph Lemon. He subsequently danced in Lemon's Company until 1995. 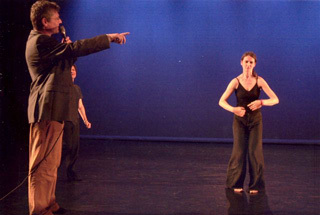 During this time, Cardona's first work, Solo Alone/Add One, was performed at the Cannes Festival and Judson Church/Movement Research in New York City. In 1995, he choreographed his first collaborative suite of dances, Made In Voyage. Commissioned by Danspace Project, a solo-version of Made In Voyage was performed in six countries and selected for the 1996 Plateaux - Biennale Nationale de Danse du Val-de-Marne. Later that year, French choreographer Hervй Robbe invited Cardona to create a new work - a double purpose/a double emploi - for a cast of four American dancers and Robbe's company, Le Marietta Secret. The following year, Wally Cardona Quartet (WC4) was founded and, in 1998, debuted at The Joyce Theater. Since then, Cardona has created eight works for WC4, four of them evening-length. Commissions include Brooklyn Academy of Music's Next Wave Festival, Portland Institute for Contemporary Art's TBA Festival, Jacob's Pillow Dance Festival, Dance Theater Workshop, Danspace Project, Symphony Space, Ricochet Dance Company, Company OFF/ Trafу, and Paradigm. International engagements include France, Germany, Austria, Belgium, Hungary, Sweden, Denmark, Australia, Portugal, Argentina, Chile, Korea, and Mexico. Cardona's choreography has been recognized with multiple awards from the National Dance Project, the Jerome Foundation, the National Endowment for the Arts, New York State Council on the Arts, The Fund for U.S. Artists and BUILD - a program of the New York Foundation for the Arts, and a single award from The Multi-Arts Production Fund. Classes are inspired by Cardona's ongoing studies with Barbara Mahler and Susan Klein, performance work with Deborah Hay, practice of improvisational forms, and history with traditional/classical dance forms. He resides in Brooklyn, NY. Using the luxury of many continuous days dancing together we will take the time to investigate different states of awareness. Each class will be three-fold beginning with a guided improvisation to inspire the imagination to expand into the unique life of different parts of the body. This will be followed by dancing within some technical forms to support our range and work as dancers. Class will conclude with learning a phrase to integrate concepts of weight and lightness, initiation and intention. We will also use the process of learning a combination to observe how we retain "set" material. The technical work and combination will be specifically structured to build our knowledge of individual physical patterns that may be blocking us from deepening the use of our selves as artists. The merging of the unconscious life of movement through improvisation and conscious attention to the the physical imagination and all its richness is part of the energizing practice we will explore every day in class. Juliette Mapp is a dancer, teacher and choreographer based in Brooklyn, NY. After graduating from Sarah Lawrence College in 1993 Juliette went on to dance for numerous choreographers including Stephanie Skura, Pat Graney, Orjan Andersson, Neil Greenberg, Vicky Shick, Irene Hultman, John Jasperse and most recently Deborah Hay. Juliette received a New York Dance and Performance award (i.e. Bessie) for her dancing with Mr. Jasperse in 2001. Juliette was an assistant to Mr. Jasperse, helping create dances on Baryshnikov's White Oak Project and Ballet Lyon. Juliette teaches throughout the world and in NYC she regularly appears at Movement Research, Dance New Amsterdam, Trisha Brown Studios and Hunter College. Juliette also makes her own solo and group dances. In April, 2005 Juliette premiered her sixth anti-war dance, "one", a piece for 70 members of the New York dance community presented by Dancespace Project at St. Marks Church. Juiette's dancing and teaching is influenced by her study of the Alexander Technique with June Ekman, Body-Mind Centering with Rose-Anne Spradlin, Skinner Releasing with Joan Skinner and Kinetic Awareness with Elaine Summers. I don't teach any particular technique, but my classes consist of things that I have found important in my own work as a dancer and performer. I emphasize the wholeness of movement, which to me means taking advantage of the movement of the whole body, all of its different joints and vertebrae. This also involves recognizing where the movement starts from - where its impulse is. One subject that I am exploring is how to bind movement into fluent phrases and the benefits of using breath in doing so, especially when the sequence requires speed and strength. I want to teach movement that is ergonomic and pleasant to the body, although this does not mean it is easy! I start my class with a warm up that takes into account all the joints of the body and e.g. wakes up the coordination of the arms and legs. Centre floor sequences focus on loosening up the tightness of the body and mind. Dance sequences across the floor and the ones at the end of the class explore different ways of combining one movement with another as well as changes in dynamics i.e. force and breath. So I can promise a lot of articulation of arms and legs, fluid movement of joints, bodies off balance, taking advantage of the floor whilst moving and a whole lot of great music and fun! As a dancer, I worked with choreographers for who writing and composition are the mainspring of their creations : Odile Duboc (Fr. ), Dominique Bagouet (Fr. ), Trisha Brown (U.S.A.)... Each one with his own way, has reinforced my liking for abstaction and danced mouvement. In my own work, I try to reconsidere the constituent elements of my practice of dance : jump, walk, run, breath, balance... to play with this elements and to reduce them to their most basic dynamic function. Length, quality and direction compose the mouvement. During the class, the exercizes and choreographic phrases involve the dancer more in a dynamic motion than in the form. I like to play with segmentation and compactness of the body. Degrees of tension and release induce the musicality and also the presence of the dancer. During workshop, the same finality is researched through improvisation and composition. 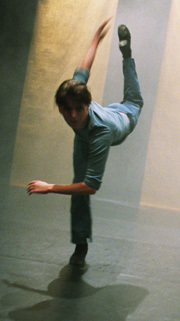 Sylvain Prunenec collaborated with numerous choreographers, amongst them Odile Duboc, (Insurrection, Projet de la mati?re, Pour m?moire, Brins d?histoires), Dominique Bagouet (Meubl? sommairement, Necessito, So schnell), Trisha Brown (One story as in falling), Herv? Robbe (Id, V.O. ), and he?s also dancer for Nathalie Collant?s, Lo?c Touz?, Boris Charmatz? Moreover, he took part in the Christian Rist?s piece dedicated to Arthur Rimbaud and to C?lia Houdart?s creations. For the cinema, he is an actor for Olivier Ducastel and Jacques Martineau in Jeanne et le Gar?on formidable (Jeanne and the fantastic young man) (1998) and for Jean-Paul Civeyrac in Toutes ces belles promesses (So many beautiful promises). Since 1995, Sylvain Prunenec has been creating his own pieces, with the collaboration of musicians : Verso Vertigo (Fondation Cartier, Paris, 1996), B?ti (Beaubourg, Paris, 1998) with Fred Bigot, electronics musician ­ Zarb (Blois, 2000), La Finale (IRCAM, Paris, 2002) and Fronde Ethiopia (Festival Montpellierdanse, 2002) with Fran?oise Rivalland, percussionist. Since 2000 he has been weaving links with African artists, the Ethiopian Dance Company Adugna, and Studios Kabako, Faustin Linyekula?s Congolese Company. Together they created Si c?est un n?gre/autoportrait for Le Vif du Sujet at the Avignon Theater Festival (2003) and are developing a project between Ethiopia and Congo entitled Kin-Addis / Chantiers chor?graphiques. In 2003/2004, a resident artist at the Forum, the Blanc-Mesnil covenanted theater, he puts up two pieces dealing with the dismembered body : Effroi solo (2003) and Redoux for six interpreters performed in Beaubourg, Paris, 2005. Actually, he?s beginning a new research to create Lunatique (solo) and Ligne de fuite for 2006/2007. - Danse improvisation (reflexion on the creation of choregraphy). From 1996 to 1998 : Participation of world championship Battle of the year 96 in Germany with the company Namur break sensation. Meeting with Farid Berki. Dancer in the company Melting Spot ( Villeneuve d'Ascq ), Meeting with the dancer Storm, Participation in the creation Йtat d'urgence company Funk Attitude (Tourcoing) directed by Jean Pierre Douterling. 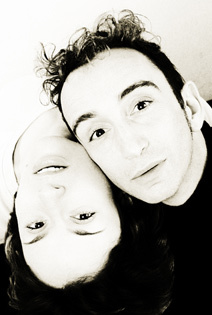 Since 1998 : Dancer for the company Kдfig (Lyon), Creation of Rйcital in Maison de la danse in Lyon, Dancer for the company 6° sens (Roubaix) with the creation Notre 6° sens. 2000 :	Creation of the show Pas a Pas in South Africa for the festival Lomba in Durban. 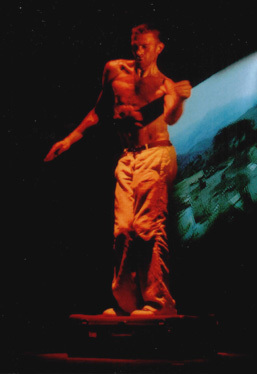 2001 :	Dancer in 10 Versions of the company Kдfig ad tour in Canada. composition "The poetry of movement ~ The movement of poetry"
While we (clown and mime Andrea Ruberti and me) were researching the material for Gina and Miovanni, we discovered that poetry is to literature what contemporary dance is to dance art, particularly the poetry that fascinated us at that time. I am interested interested in the expression, potential, thought and energy of motion, which carries its own story. You can manipulate this story in your thoughts and get different responses to the same suggestions. The fact that such different types of body training as pantomime and dance can form an interesting field for meeting on grounds of matching contents is likewise interesting. In workshops, we will explore the potential and expression of motion created on the basis of poetry. According to different sources, we will guide the shaping of individual materials and develop the qualities and importance of motion in particular. We will be looking for accurate and conscious directing of attention towards movement and discovering personal stage space. Then we will look for was how to make interaction between people and material, how to compose the picture with or without poetry in mind. We will look for the ways where and how contents and contexst meet and interact. Maja has long dance history. She studied at the Secondary School of Ballet in Ljubljana, at CNDC L'Esquisse in Angers, France and has participated numerous diverse workshops in Slovenia and abroad. She has extensive stage and film experience performing especially with En-Knap Dance Company in Iztok Kovaи`s productions (Spread your wings, you clumsy elephant, Sting and String - first touch, Codes of cobra, Kaktus unter Strom, Perfect Step?...) and films (Narava Beso, Vertigo Bird, Dom Svobode). She performed in short film by Hanna A.W.Slak - "A.M.", short film by Zemira Alajbegoviи - "Fast/Slow", and in longmetrage by Ema Kugler - "Fantom". Maja has created and toured with her own choreographies: Manifestation of the Introvert (1995), Gina & Miovanni (1999), 6agon (2001), Tovarishi (2001) and Mezzanino (2002). 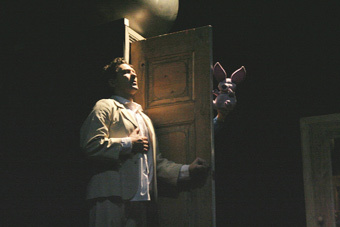 In collaboration with Mala Kline, dancer and choreographer, Maja Delak in 2004 created Properly Blonde as closing performance of Agon programme. In the same yeat they collaborated with director and designer Mauricio Ferlin and created site specific performance Rondinella and dance duet HI-RES. In september 2005 Mala Kline and Maja Delak presented a closing work of Agon-Research programe, Galery of Dead Women, piece created for six dancers and actress, based on the H. Miller`s text Hamletmachine. Class starts with simple aligment exercisses applieing Kline and Alexander techniques. As we bring our bodys to the floor, we start with stamina exercises, moveing in and out from floor. At this point image of body falling through space is applied. Floor combination is build up to confronte students with diferent qualities and ways of useing the body. After stending we look at aligment again. Starting with exercises on spot, we look at pelvis and spine connection as a base for any given movement material. Students are asked to work within their body specifics. Starting to build movement sequances traveling through space, body awarnes is increased by deconstructing movements, sperateing arms and legs exercises. Still focusing on body falling, spiral becomes main focus, shifting intention from distal to inner support. Combination at the end fuses all pre-used movement principles playing with diferent dynamics. Aim of class is to find optimal body placement in order to be able to shift betwen diferent movement qualities and dynamics.